I have two very different reactions to this book. 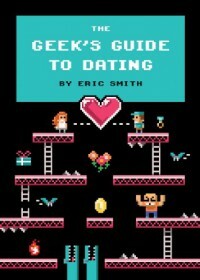 Both make a lot of sense when you consider the two facets of this book: Geeks and Dating. The first is an almost fan girlish squeal at all the geek fandoms brought up in this book. Games which include everything from Legend of Zelda and Final Fantasy to Fallout: New Vegas and Skyrim, TV shows which include the obvious Star Trek and Doctor Who but also V and others. Movies, comic books, technology; it's all here and all referenced. However, if all this had been was name drop after name drop, it would have gotten old with more speed then The Flash. ;P Instead, the book weaves each mention into the narrative, giving the reference a purpose for being mentioned rather then simply a marketing ploy. Even the fandoms I am not knowledgeable in, I was able to grasp the gist of what the author meant. These parts of the book were well planned and well executed. The second part of the book was the dating aspect. Before I tackle this, I want to make it clear: I don't read dating books. I've never found them helpful as they are too generalized and often they are simply trite. I took a risk with this one as I enjoyed the 8-bit pictures (I'm not denying it) and the idea of a book like this pitched to geeks. And...mostly...the book succeeds. The first chapter was quite excellent with the Geek Special Abilities List as well as the classifications of the different types of geeks and their sub-catagories. I had never really thought of the different types before and with the break down of their abilities, it really made me think about what type of geek I am (Book Geek of course) and what that meant towards how I react, etc. Likewise, the end of the book, appropriately enough about the ending of relationships was handled quite well. The best and worst ways to handle breakups are articulated and handled with a good bit of care. Both of these parts of the book were enjoyable and fast reads. The middle of the book, however, I did not find very helpful nor incredibly enjoyable. The references to fandoms were as I stated above. However, the dating aspects of the writing (which was rather the point of the book) were...just the same as could be found in any dating book. Yes, parts of it were tailored to geeks but most was generalized and quite frankly, dull. I gutted my way through the book with the helps of the pictures, the references, and a great deal owing to its short length. All in all, not a bad book and if you like geeky TV shows, movies, comics, games, etc. then you'll find lots of fun tidbits. It is slanted to guys, though he does take the time to address this and talk about how you might read the book to aid a female, but it heavily comes down on the male side of dating. If you are genuinely looking for a dating guide though,k I don't think I can recommend this. Most of it is trite, obvious, and rather dull. So a fun read...but not a great one for its stated purpose. 2014 Library Books Media Tie-in Non-fiction The Knights Who Say "Meh" Where Was This When I Was Young?